Mayor Hancock Walked Deadly Federal Blvd and Saw It’s Still Very Broken. Will He Fund a Fix? Maybe experiencing the indignity of walking Federal will kick things into higher gear. Maybe not. There’s a typical scene and soundtrack on Federal Boulevard: The whir of revving engines as motorists whiz by, trying to beat every red light in their way. Cars and trucks speed inches from the sidewalk where people walk and wait for the bus. Drivers bully people as they cross the street, encroaching on crosswalks — where they exist — and creeping on pedestrians when they stand in the way of a left or right turn. 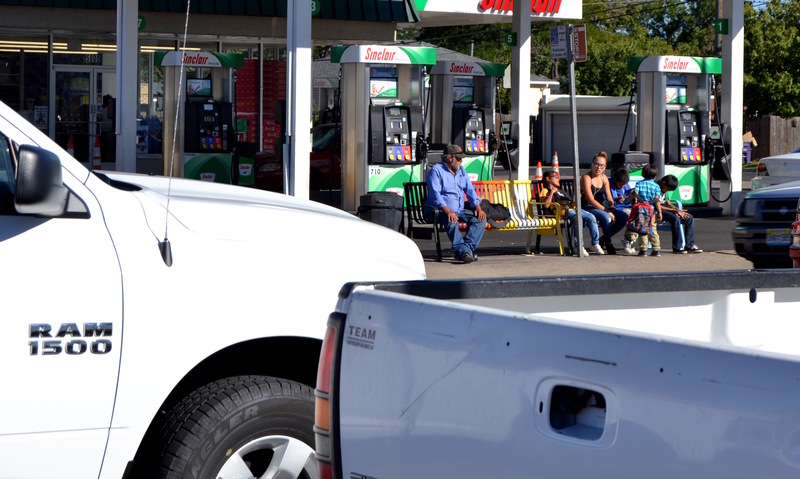 Out of Denver’s many streets, Federal Boulevard is probably the biggest affront to human life. Staggering traffic carnage statistics say as much, as do the people who traverse the corridor daily. People like Melissa Vigil. Vigil, 41, missed her bus. The driver didn’t see her because she was obscured by a herd of safe streets advocates and government officials, including Mayor Michael Hancock, looking to experience Federal’s hostility first-hand. The sidewalk was barely wide enough for a couple holding hands, let alone a large group of people. They overflowed onto the street. Orange-vested traffic engineers walked in the roadbed to usher them along safely. This gathering wasn’t random. The Regis University Community Council, a group of residents, businesses owners, government employees, church members, and staff from nearby college, organized the walk along the street’s northern-most sections near the border of Adams County. It was another attempt by neighborhood advocates to drive home the importance of fixing Federal because people’s lives and well-being depend on it. The point was to give decision-makers a taste of something they don’t experience often enough: the indignity of walking on a street built solely to move cars at high speeds. “Activate your body by using all of your senses” and “feel the sidewalk under your feet — if there is one,” Linnea Bjorkman, a community liaison with Regis, told the group of about 55 people before they took off on a frenetic walk alongside traffic. That group included Hancock. He proposed his 2019 budget the same day. 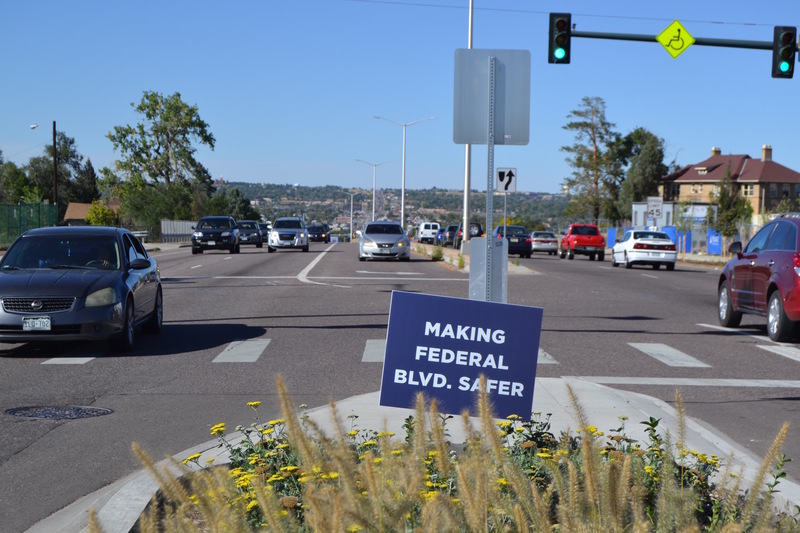 You won’t find a line item specifically for safety improvements on Federal in the 588-page document. Yet city officials say $53 million worth of help is on the way — more on that in a second — and Hancock says he is hyper-aware of the street’s problems. “It’s important for us to be here,” he added. And it’s important to fund drastic intersection redesigns if city officials expect the carnage to stop. But out of the $53 million dedicated to “improving” the street, $33 million will fund a road widening between 7th Avenue and Holden Place, a treatment known to increase driving speeds, lengthen pedestrian crossings, and induce traffic. Planning documents show that the widening has always been about making it safer and more convenient to drive [PDF], but not lowering traffic speeds, which is the top factor in pedestrian deaths. The streets department will install basic safety fixes like wider sidewalks and colored crosswalks, however, leading the Hancock administration to parade the project around as a Vision Zero miracle. Here’s what the other $20 million will fund on Federal, according to DPW. Some of the projects come from federal and state buckets, some from local coffers. Some of the money is leftover from the 2018 budget. An analysis to improve transit on Federal, which could result in a bus rapid transit project like the one destined for Colfax. New traffic signals at 10 intersections. Asked whether pedestrians would have an automatic walk phase, DPW spokesperson Nancy Kuhn wrote in an email, “We always encourage people to press the pedestrian to get full crossing time.” Gonna call that a no. Seven of those intersections will give people walking a head start, three won’t. Pedestrian signals will have the countdown function. A blinking “HAWK” pedestrian signal at Federal and Bayaud. $420,000 worth of new sidewalks to fill gaps in the street. “Vision Zero safety improvements” at 49th and 51st avenues. DPW would not specify what the improvements are. A new signal more aligned with the Harvard Gulch trail connection. Removal of the right turn bypass lane from westbound Howard to northbound Federal. New LED lights and replacement of burnt out bulbs. From Alameda to Evans and from Howard to 10th, drivers will see more red lights during “overnight hours” to slow driving speeds when traffic is sparse. A median, just completed, at 52nd Avenue, which DPW claims will slow down traffic (the jury’s out on how much these things help). 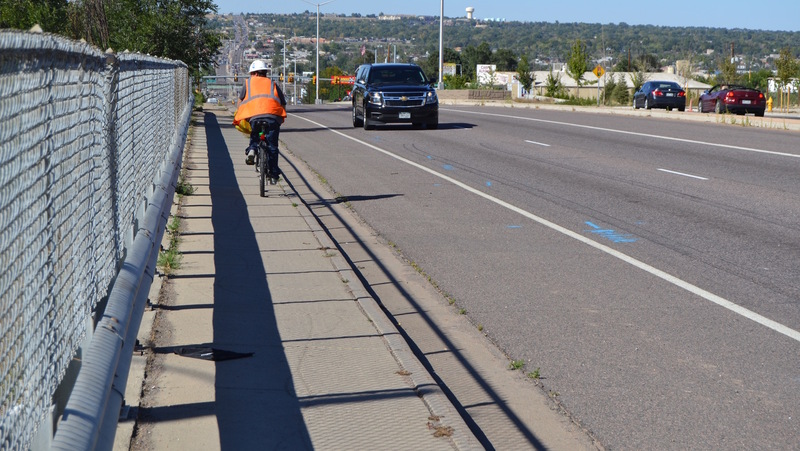 DPW nor the Colorado Department of Transportation has plans to narrow lane widths or add curb extensions to slow drivers and reduce crossing distances for vulnerable pedestrians. The biggest miss in the Mayor’s budget is no new funding for safety improvements on Federal Boulevard. Federal is not only Denver’s deadliest street, with a traffic fatality rate 20 times the average for urban streets in Colorado, it’s also an essential transit route and “Main Street” for the 26% of Denver residents who live in neighborhoods along the corridor, many of whom are low-income and people of color. 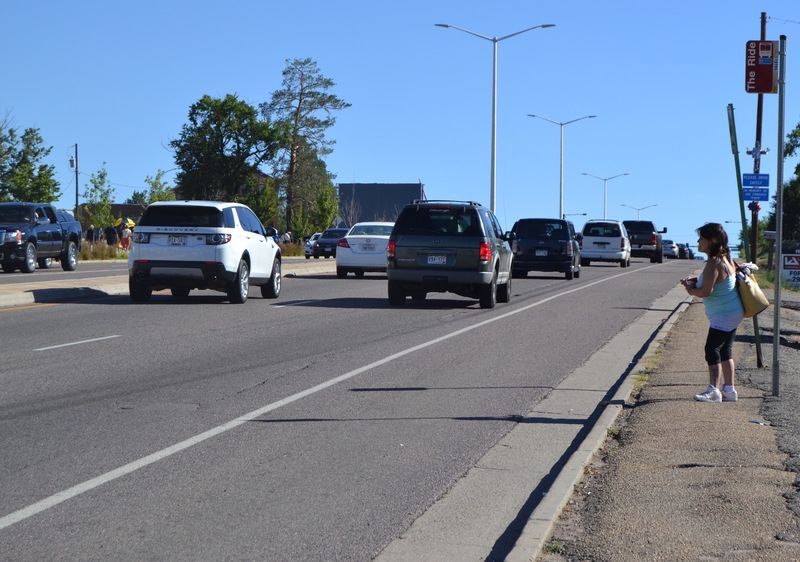 In excusing this lack of investment, the City points to previous commitments from CDOT and other sources for projects such as the widening of Federal between 7th and Holden – a project with questionable safety benefits. We applaud the Mayor for taking some important steps to demonstrate his commitment to people-friendly streets… However, the 2019 budget proposal doesn’t meet the overall standard for investment in people-friendly streets because it fails to fund meaningful progress on the lack of sidewalks and doesn’t recognize the immediate, critical need to reconstruct Federal Boulevard. We sincerely hope that City Council will join us in pushing for an additional $5 million for investments in sidewalks on Denver’s most dangerous streets and $5 million for safety improvements specifically on Federal. WalkDenver is urging residents to nudge their city council members, who will ultimately approve the budget, for more funding through its action center.